In this region of the world farmers rely on their coffee harvest to provide for their families over the entire year. The use of bees in coffee growing has been a crucial step in helping the buds set and allows for the coffee tree to blossom. Each blossom represents a coffee cherry, unique and beautiful, and also vital for the coffee farmer. These farmers position their hives within the coffee plantations allowing the bees constant access to the coffee blossom nectar. The farmers use mobile extraction processes due to the remote and sheer steepness of the terrain. We have known the Mendez Family for years, but it was one day on May of 2015 that we first discovered their Coffee Blossom Honey. We were hosting coffee roasters at their plantation when we were offered a taste of their Coffee Blossom Honey. We tasted the honey and knew right then that we must share this with the rest of the world. Over the next year we learned the process of exporting and importing honey. We also learned how we could support the Mendez Family better with their honey production and bee health. Mr. Van Westendorp was one of our first contacts to learn about bee health and honey production outside of the US. We first met Paul while he was giving a presentation on bee health and disease in the US. We stayed after the seminar to see if we could make a connection. The crowd around Mr. Van Westendorf was growing smaller and smaller as people left and we had our chance to connect. Paul was very curious about our project and we regrouped at a coffee bar to continue talking late into the night! Paul has been our resource ever since and provides guidance to our US and Guatemalan Team. Just like with coffee the equipment and processes make all the difference. The Coffee Blossom Honey is one of the most regulated honeys in Guatemala. To be considered honey from Coffee Pollen, the apiaries must be within 1 km of the primary nectar source and the harvest must happen right after the blossoms fall. 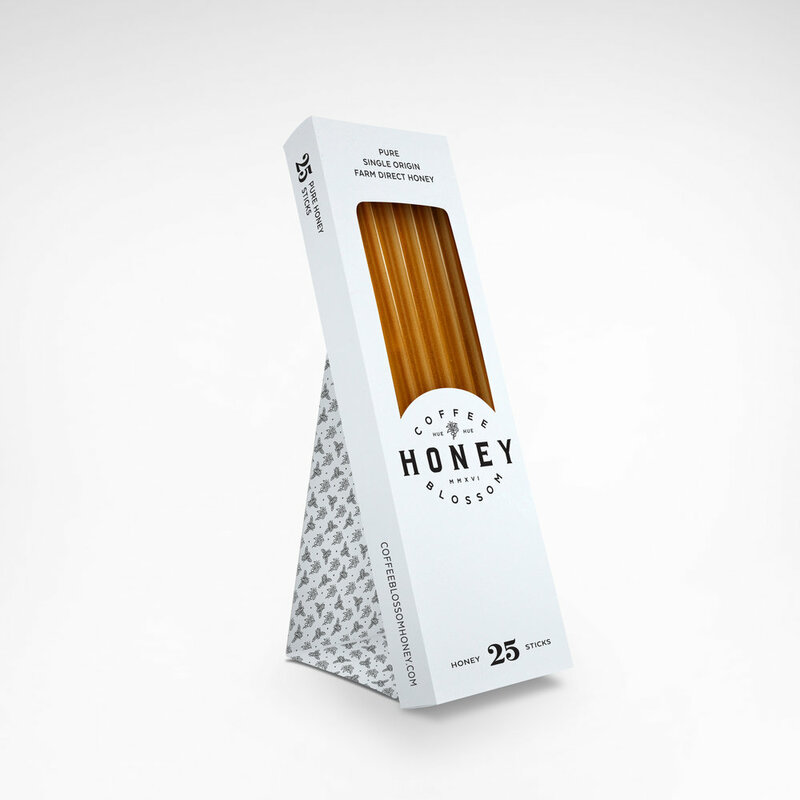 We’re excited to announce the launch of all new Coffee Blossom Honey Stick packaging that we're calling The Kickstand Box. Each box carries 25 sticks of single-origin Coffee Blossom Honey sourced directly from Jorge Mendez and Finca El Apiario in Huehuetenango, Guatemala. The dual function design of the box offers unique solutions for enjoying and sharing Coffee Blossom Honey anywhere! 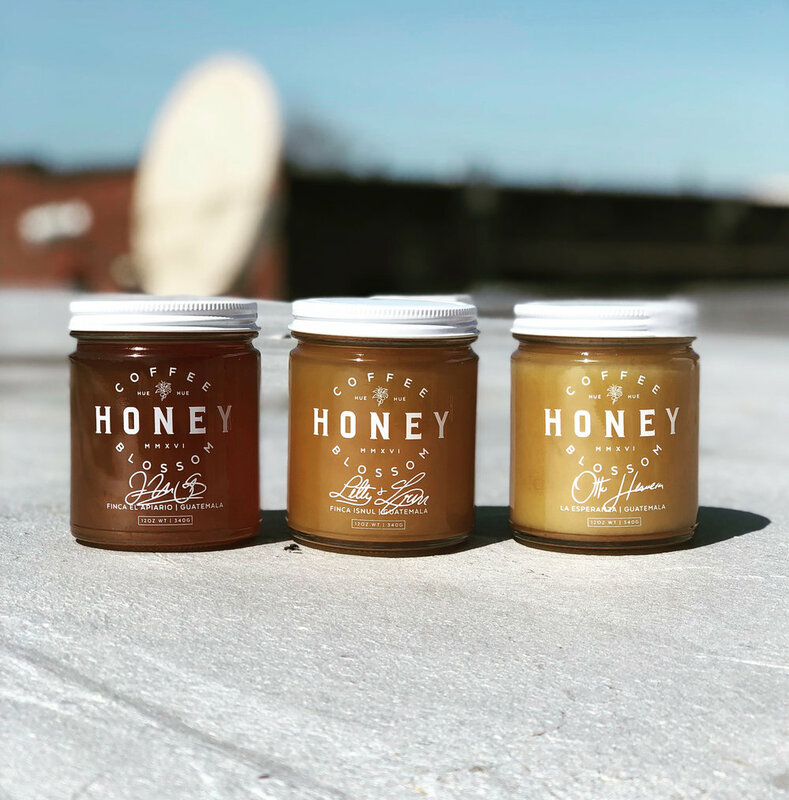 Easily carry the box in your pocket, backpack or purse and you’ll never again face a day without a stash of raw honey. Utilize the included Kickstand and removable lid to easily convert the box into a countertop display for sharing Coffee Blossom Honey with friends, coworkers or customers. The Kickstand Box was thoughtfully designed, die-cut and letter-pressed for Coffee Blossom Honey by Vice Versa Print Shop in Bellingham, Wa.